How much of your attendee’s session time is spent taking notes? How often do those notes get revisited? The only thing worse than not providing enough information is providing too much. But it’s less walking a fine line and more knowing your audience. A great deal of time and effort is put into corporate event planning, so when you bring people together in a meaningful way, don’t waste this great learning opportunity by trying to do too much and stuffing your attendees’ brains. No one wants to feel like their event was a bust, so avoid information overload by using these tactics to ensure your attendees get the most out of your conference. Why are we here in the first place – the people. Be sure to prioritize your people and not just the information you want them to absorb. Content and learning opportunities are important, but since people are different, so shall your content be. We always say that one size won’t fit all, and that’s to ensure relevance as well as to not waste precious moments of your attendees’ time going over content that can’t move them or their mission forward. Understand your people – how they like to learn, what tracks they’re interested in following at the conference, what success will look like for them when the event’s dust clears. The best way to capture your attendees is to relate to them. Don’t just spit words at them, use a theme, a story arc to captivate them with anecdotes and stories that are relatable, practical and feature real life examples. After a presentation, 63% of attendees remember stories, and only 5% remember statistics according to a Stanford University experiment. While retention improves when you relate the info back into a story, information retention rates are highest when people are actively participating. According to The National Training Laboratories, information retention is 5% for lectures, 75% for applying information. Your breakout sessions are the perfect time to ditch passive learning and get your audience to participate. Implementing active learning is as easy as creating a trivia game at the end of the session or having groups work through a case study together throughout the presentation. This participation tactic not only increases brain flow and engagement but also prevents the info from going in one ear and out the other. According to Edgar Dale’s “Cone of Learning”, we remember 10% of what we read, 20% of what we hear, 30% of what we see, and up to 90% of what we do. Your attendees aren’t robots – yet. They’re real people with a limited energy source. Scheduling a short period of time each day where no sessions are going on will greatly improve your attendees’ moods. This lets your people take a guilt-free break to wind down or catch up on work back home without feeling like they’re missing out on any important sessions. Plus, they’ll naturally use this time to network if you create the right space. To an event coordinator, it may seem like time lost, but it won’t be that way to your attendees. The University of Illinois at Urbana-Champaign conducted a study where four groups worked on a brain-intensive task for 50 minutes. The group that took more breaks had the highest mental stamina at the end. Opportunity for extra rest can increase their health and wellness during the conference, leading to more energized and engaged attendees. Even a couple 25-minute breaks throughout the day can significantly improve active participation, which makes a huge difference for the success of your event. During any keynote presentation, a majority of attendees can get lost scribbling away notes in their notebooks. Often, they’re left with too many notes and not enough takeaways. Social media sets attendees loose from falling victim of excessive note taking. Facebook and Twitter can be especially great tools to help organize information that your attendees can access at any time. Have members of your team live tweeting the important nuggets of wisdom during keynotes and important sessions to create a feed of essential event highlights that can be reviewed at any time. Twitter’s Moments tool makes organizing separate feeds easier than ever. Another option is to go live on Facebook or Instagram and let attendees utilize the saved feed at the end of the day. This can help people refresh their memory after the session is over, and it’s an opportunity to gain some views from your non-attendees. Not only is conversing with others a way to relax, but it will likely lead to them talking about their favorite parts of the conference with each other. Attendees can share what the other may have missed. It’s also an opportunity to absorb the information from another perspective, and see what someone else took out of the session. Research has shown that complex ideas can be processed more easily when communicated via a range of sources, such as peers. Peer learning has been proven to provide individuals with a better understanding of the content discussed. This is because we can often phrase things in more simple terms, providing absorbable information. Provoke these conversations by placing talking point cards on tables at a networking cocktail party for instance. Learning is at the forefront of every conference, but information overload can cause it to take the back seat. Don’t just sit there and let all your hard work be ruined – get out there and create happy attendees (without overworking their brains). Implementing effective learning practices is a powerful avenue to increase engagement and maximize your event ROI. These practices aren’t the only way to increase your return. 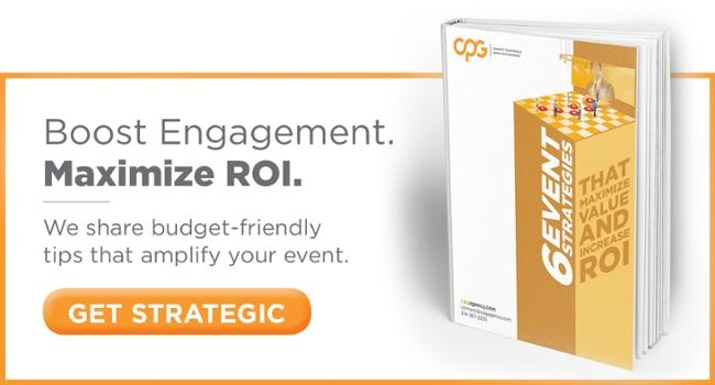 Check out our free eBook and discover creative ways to get the most out of your next corporate event.